I recently purchased a big box of new toys for our budgies (more reviews to come!). Drs. Foster & Smith is my first choice for buying parakeet toys. They have a massive selection, awesome exclusives, and it seems like there are new items every time I stock the toy drawer. Additionally, their prices are very reasonable, and if you sign up for emails you’ll be notified of their frequent sales and coupon codes. Shipping is always free once you’ve spent a certain amount, as of this date it’s $19 but I know sometimes it’s higher. One of the toys in my last order was the woven corn husk toy, small. As soon as I pulled it out of the box I knew it would be a huge hit, it’s got preening, destruction and tarzan-style swinging possibilities all in one toy! It’s held together on a thin steel bar, which is awesome because we can always reuse that once the toy has been thoroughly murdered. Technically this is a foraging toy, you can put treats inside the little vine balls, but I don’t bother, they love destroying the balls just for the fun of it, so the treat aspect is pretty unnecessary for us. There are loads of different textures to chew on, Toby likes the vine balls best, but Kelly likes to dig in to harder material, within 24 hours she had already chewed off one of the little wood blocks, but that leaves her with a lot more work to do. 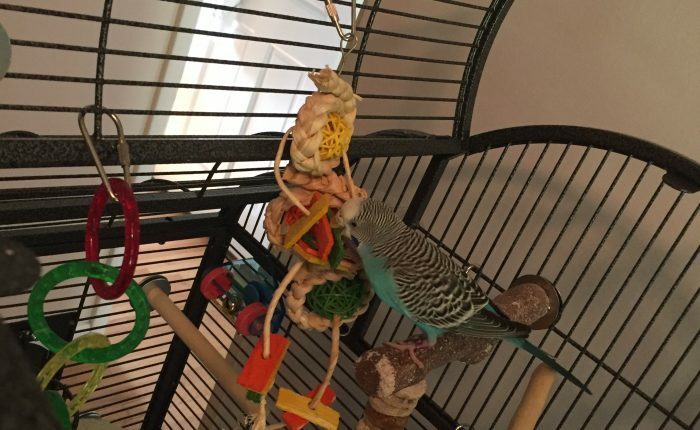 I also love that the rope parts can be pulled through the balls, so when the budgie pulls one end it actually does move through before there is resistance. My only issue is with the supreme cotton, I’ve seen alarming headlines recently about parrots eating fabric rope and getting huge masses in their crops that have to be surgically removed, this cotton rope seems like it would be a contributing factor to that sort of condition. It’s very loosely bound and fluffy bits pull off pretty easily. Even if they didn’t mean to, I could see a parakeet ingesting bits of this during a preening sessions. There’s even a note about the dangers of birds eating the rope in the product’s description. Fortunately the rope is just tied (not even tightly knotted) at intervals and easy to remove without even using scissors. There’s so much else to do with this toy that the rope seemed pretty superfluous to begin with, and we’ve got other toys that are dedicated to soft-material preening. Additionally the parakeets can preen each other or the human members of the flock! So – thumbs up from the humans and the parakeets for this product, and at just $6.99 at the time of this writing, I think it’s an excellent value. I would recommend modifying it to remove the cotton, just to be on the safe side. Previous Previous post: Does molting make a parakeet sick?